Diversity: Yes, you read that correctly: by my count (and I’ve cross-checked a couple of times just in case) Erle Stanley Gardner published ninety-seven books in the space of 39 years, and that’s not including short story collections and without considering the individual stories themselves – somewhere in the realm of 200 of them (Wikipedia informs me that Gardner set himself a target of 1.2 million words a year – 100,000 a month, approximately the total word-count of The Adventures of Sherlock Holmes – while writing short fiction for the pulps, many of them under pseudonyms). With that much output comes one of two things: the same story, worn infinitely thin and threadbare through retelling, or a range of styles, approaches, forms, characters, and ideas that tell of an imagination on fire, quenched only by its own overflowing. Inevitably it will only be possible to have sampled a small proportion of that, but what I’ve seen of Gardner covers a truly spellbinding range: obviously his Perry Mason legal thrillers – which, while often unsteadily constructed and rather episodic in their nature (at leat to my experience), show a propensity to link together some startingly-realised ideas with supremely vivid writing – but also his Doug Selby “The DA [does something]” novels – the three I’ve read are head-spinning in their complexity (and, at times, their frank unlikeliness…) and showcase some excellent technical writing – which, despite sharing the same DNA, exist in a separate realm of plotting, construction and development. He also, as A.A. Fair, wrote noirish novels about private eyes Bertha Cool and Donald Lam, one of which – I’m pretty sure it was Bats Fly at Dusk (1942) – was the first Gardner I ever read, without even realising it was a Gardner (it is, unfortunately, now lost to various house moves). Additionally, though often without Gardner’s explicit involvement, the character Perry Mason was adapted to TV, movies, comic books and radio, ensuring the broadest range of media for any single King. That there was such scope for this author’s work speaks volumes, I’d argue, for the clarity of the idea at its core; he could be taken into almost any area and preserved by dint of the essence of what he represented, and that’s no small feat (just witness the recent Tommy and Tuppence adaptation the BBC fouled up, and it’s not like they were especially complex characters…). Growth: I’ve read around 25 Gardner novels, and what particularly strikes me about his novels is the hooks that latch into you in the opening chapters – an actress hired for a job she has doubts about, say, or a man curious about the behaviour of his wife. From this was then spun a sometimes spurious but nevertheless hugely entertaining narrative where the entire system you came to depend on in a crime novel was up for grabs. It was only after reading ten or of Gardner’s increasingly-frenetic plots that I learned of his proclivity for plot wheels as used by Edgar Wallace: forget Raymond Chandler’s “When in doubt, have a man come through the door with a gun in his hand”, this was a wheel of fortune of plotting from which was spun your next device or incident (examples can be found here). Now, it’s very much a matter of opinion, but while this in no way improved Gardner’s plotting, which was played as something of a short game, I’m very much of the school that feels it helped his writing no end. While resorting to such measures should probably be disdained, what happened was that Gardner side-stepped the conventions of formula time and again; never given an opportunity to rest on the laurels of a structure that had serves him well in the past, he wrote for his life to negotiate the next twist – possibly as unexpected for him as it was for us, if you want to get all meta about it. So here’s how I think Erle Stanley Gardner grew the genre: he showed, time and again, how to tell a story in vital, economic, and thrilling prose. He made it impossible to claim that quantity of output lessens quality of expression (arguably the latter excels the former in several cases), and raised whatever bar-metaphor you like for acceptable written standards in the genre. If even 1% of the authors working today could write – never mind plotting, just simple one word and then the next word writing – as well as Gardner, we would be spoiled with a richness of prose that would be barely comprehensible for its origin. Of course, he also extended what was permissible in crime novel protagonists. I have no proof of this, so please correct me if I’m wrong, but it’s my distinct impression that Bertha Lam was the first female PI in fiction (I’m aware Andrew Forrester’s The Female Detective has been reissued by the British Library Crime Classics series, but she was rather more of an amateur, wasn’t she?). Don’t forget that An Unsuitable Job for a Woman by P.D. James was seen as a fairly big deal upon publication in 1972, and Gardner definitely beat that to the punch. Additionally, the one Gramps Wiggins book I’ve read, The Case of the Smoking Chimney, is perhaps the only Elderly Spinster Detective novel wherein the Elderly Spinster is actually an Elderly Bachelor (though again the British Library have brought J. Jefferson Farjeon’s tramp protagonist Ben to my attention, but again I’ve not read any of those books). And, of course, it’s hard not to credit Gardner with the unscrupulous lawyer archetype, be he a devilish trickster or a charming rogue. But you know all about that, I’m sure, and I’m going on, so let’s skip ahead. Durability: For someone of Gardner’s undoubted productivity, it should be easy to trace the ripples of his splash in our crime writing pool (hmmm, stretched metaphor much?). You can draw a direct line from Bertha Lam to Dennis Lehane’s Angie Gennaro, Sue Grafton’s Kinsey Milhone, Sara Paretsky’s V.I., Warshawski, but does that mean those stories have endured? If you say “Perry Mason” these days, people probably think of that sub-burlesque-music theme song and Raymond Burr rather than the man who created the character, and asked to name a novel most people will draw a blank look (and, dear crikey, there are enough titles to choose from). But then, the character in whatever form has entered the public consciousness, which is more than can be said about last week’s king Anthony Berkeley. For me there are two key aspect beyond merely his novels, though. The first is, as I’ve said above, the sheer quality of his writing and the ways this impacted on the genre. I see shades of Gardner in Carr, in Queen, in Berkeley, in Stout (who he just edged out for this fourth throne), and I feel him in my perfectly valid expectation of enjoyable prose and a high standard of writing every time I pick up a novel. Writing cheaply and cheap writing are very different things, and Gardner showed how this was possible. The second, and this is perhaps a little out of my remit, is the thousands and thousands of hours he poured into The Court of Last Resort – an enterprise he set up with other legal and medical experts to review potentially unsafe convictions and challenge attitudes, evidence or slapdashery where they may have been invoked incorrectly to jail innocent people. Not only is this a staggeringly selfless and wonderful endeavour that speaks of the kind of soul-enhancing service for humanity that so many more us should be capable of, it has also provided the basis of many a crime novel in the decades that have followed, and but for Gardner we may never have believed such a thing possible. I am aware that this is already my longest King of Crime post, and I’ve left Gardner to last purely because I was trying to work out a way to fit everything in. Essentially the core objection revolves around how good someone can be if they’ve written a lot of rather substandard books, and I feel I’ve already addressed this above. To extend the point (and possibly test your patience, dear reader) consider this: how many of G.K. Chesterton’s badly-plotted father Brown stories – of which, be honest, there are bloody loads – are also compelling in their prose? How many of Christie or Carr’s or Queen’s later books are similarly a slight misfiring of function over form? Practically none, right? Are those authors still considered doyens for the ages? Indeed they are, and rightly so. Okay, then. 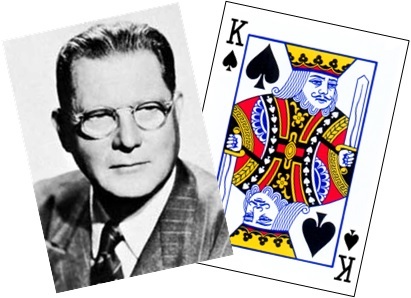 The King of Spades because…: Fittingly for both Gardner’s fictional and real life endeavours, the King of Spades is frequently said to represent a lawyer whose moral stance is something of an unknown. However, he’s my King of Shovels for a different reason: a broader interpretation of this card is that of a man who is undone by his own unchecked ambition. While his contribution to the genre is incontestable, it is true that there are no agreed classics for Gardner, no obvious place to start, and more than a few duds, and it is perhaps paradoxically down to his fecundity that he has ended up largely unloved and ignored. My thanks to those of you who have pitched in to disagree with or champion my choices, and particular thanks once again to Brad Friedman of AhSweetMysteryBlog for (admittedly, unintentionally) setting ball rolling. All we need to do now is pair up an appropriate Queen with each King and the whole thing can be settled forever! Who wants to start…? Excellent finish and I think you argued your case very well for your final king, though Gardner is not particularly a favourite (though that may be due to a lack of reading). As to pairing Kings with Queens I think I would put Marsh with Gardner definitely as they’ve probably got having a fair few dud books in common. It’s hard to decide who to pair Christie with as initially I thought Carr would be best but then I thought maybe Berkeley as they both like doing final twists at the end of their books. Based on the theme of characterisation I would put Allingham with Thompson as not only would Lugg like Thompson’s mean streets, but think motivation wise, Allingham’s crimes were committed for more various or natural reasons (in comparison to the others) and in your post on Thompson you talk about the reasons for the crimes in his book being more naturalistic. Which means I guess giving Carr to Sayers and their use of literary allusions would give them something in common. I have the feeling though that everyone will have a completely different way of pairing them all up. That’s a devastatingly quick analysis, Kate, and I love your reasoning for the pairing of Thompson and Allingham. Certainly Marsh’s formula and Gardner’s lack thereof, too…maybe she could learn a thing or two from his plot wheels! How would you have paired up the Kings and Queens? Blimey, I have no idea – I’m not even sure who my Queens are. I mean obviously Christie, probably Allingham, perhaps Brand (not really read enough) and then probably someone like McCloy (again, not really read enough to say). As It has been well-documented that I’m not convinced about Marsh or Sayers, and while I appreciate the differentness of Galdys Mitchell’s work I personally doubt the impact she actually had on the genre overall. Josephine Tey is far too minor (and doesn’t come even close to playing fair), but what about forgotten prolific authors like Carol Carnac/E.C.R. Lorac? I’ve read enough malke authors to be happy with these Kngs, but the Queens is a whole new area of exploration! Well I have enjoyed your posts on the Kings of Crime a lot, so maybe in the New Year you could do a re-examination of the four Queens and perhaps topple a few off their thrones (though I think Sayers definitely deserves to be a Queen – would much rather ditch Allingham). I’ve read a few Brands but to be honest I didn’t think she was significantly better than the established Queens (apart from Marsh). Haven’t read (but need to) E C R Lorac as she seems to be an author with a lot of buzz at the moment among the Golden Age community. Ha, yeah, no, I’m not going to take on the Queens so quickly. I do have another idea motivated by having done the Kings, but I need to test it out first before announcing it with massive fanfare (well, some clipart) and then seeing it wither and die. E.C.R. Lorac definitely features in my 2016 plans – along with about 25 other suthors I’ve yet to get round to, it’s true – and it’s very interesting to hear there’s ‘buzz’ around her now…wonder where that has come from? Ah, well, it can only be a good thing: the more classic authors there’s enthusiasm for, the closer we get to bringing JDC back into print! My interest is piqued for your next potential posting project and I’m all in favour of using clip art. I think Kate paired the Kings and Queens off well, although I would possibly pair Christie with Thompson so that he could mistreat her, causing her to disappear again and then write more magnificent novels after she has re-married . . . to Ellery Queen, who SHOULD have been here, buster! (He was a magnificent genre-crosser, too: bad movies, good and bad TV, great radio, even comic books (which I just ordered!) as well as children’s books. Poor Christie! Though to be honest having reflected on my own pairing I’m not sure Berkeley would have treated her much better, based on Martin Edwards analysis of him in The Golden Age of Murder. I love this about The Edge of Night, that’s awesome! I shall have to check that out, it sounds like one of those origin stories that seems too unbelievable to be true and so must be true. Gardner is certainly a bold choice but I’m a huge fan of his early Perry Mason books (I haven’t read the later ones). And I like his early pulp fiction. You’ll have to watch out though – the Ellery Queen fans will be out for blood! I’m a huge Queen fan, and yet I would never harm a hair of JJ’ wise and well shaped head! As for the Queens, JJ, it may be that Christie is the only one on which everyone can agree – to rephrase, only a curmudgeon could argue against her, while no ten people in a room could agree on the second name. (You say Sayers, I say to-mah-toe!) I love Brand more than Marsh, Tey, or Allingham combined. I DO have another name to propose that I’ve just discovered – I’ve only read one book, but she is marvelous! The only problem is that her output was way too slim, but if the rest of her novels are as grand as her premiere, then I might argue her case before you later! When someone who knows their Christie as well as you do starts saying things like that, Brad, that’s when things get exciting. Anyone who after one book might be able to mix in that company is certainly a cause for massive interest, and I await further news and developments very eagerly!